I like the way bridges look when they suddenly appear on the horizon or as you round a corner. Although I like to drive across and see what the bridge spans, I do heave a little sigh of relief when I reach the other side of the bridge and am once again on terra firma. This is the Vietnam Veterans Memorial Bridge that crosses the Ohio River connecting Ohio and West Virginia. I confess that I did take this shot while I was driving, but every time I drive across an interesting bridge I always think that it would be a cool picture and this time my camera happened to be laying by my side. I'm not Irish so this is my "green" post for St. Patrick's Day. I recognized this as soon as I saw it. 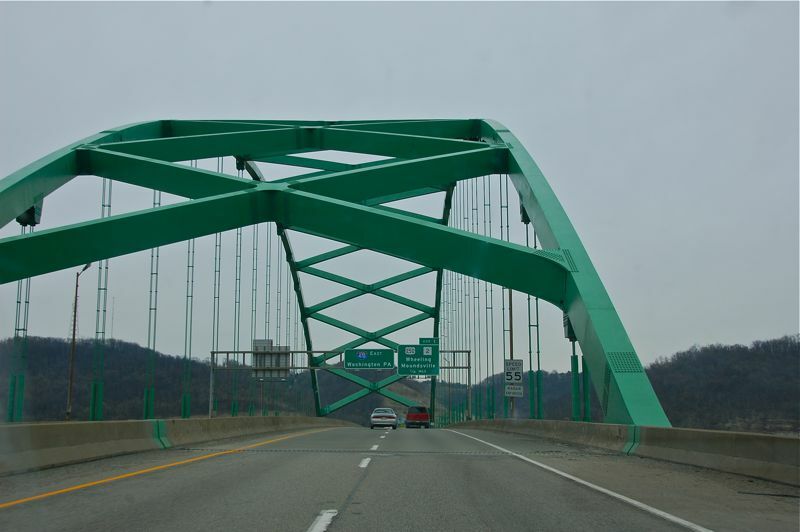 This is the bridge over the Ohio on the Wheeling by-pass. Had you stayed on I-70 (this bridge is on I-470) you would have crossed over an old suspension bridge then gone through the Wheeling tunnel. The route you took goes over the top of the mountain so there was no tunnel. When you went through Columbus going back east you went through southern Licking County, OH. That is where I lived my entire life before moving to the Philly area. I was going to take a picture of the Thornville exit but I was driving too fast.